WASHINGTON, DC, January 16, 2013 (ENS) – Interior Secretary Ken Salazar today announced he will be leaving the Obama Cabinet by the end of March to return to his home state of Colorado. Then Senator Barack Obama of Illinois entered the Senate in 2005, as did then Senator Salazar of Colorado. “In his work to promote renewable energy projects on our public lands and increase the development of oil and gas production, Ken has ensured that the Department’s decisions are driven by the best science and promote the highest safety standards,” said the President. Ken has also made historic strides in strengthening our nation to nation relationship with Indian Country, helping to resolve longstanding disputes and make tribal communities safer and stronger,” said Obama. “I have had the privilege of reforming the Department of the Interior to help lead the United States in securing a new energy frontier, ushering in a conservation agenda for the 21st century, and honoring our word to the nation’s first Americans,” said Salazar. “I thank the more than 70,000 employees at the Department for their dedication to our mission as custodians of America’s natural and cultural resources. Senate Majority Leader Harry Reid of Nevada had high praise for Salazar, saying today, “In my 30 years of service in Congress, I have never worked with a better steward of our nation’s precious natural resources than Ken Salazar. Growing up in his family’s ranch in Colorado, Ken always understood and respected the importance of protecting our country’s natural wealth. He approached his job as a man of the land because that is exactly what he is, with deep roots to the Mountain West. Environmental groups also applauded the outgoing interior secretary. “We look forward to building on his achievements with his successor, working to designate new national monuments and keeping dirty energy developers off our public lands and out of the Arctic,” said Brune. 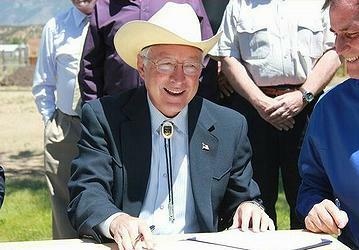 Secretary Salazar helped usher in a new era of conservation. Under President Obama’s America’s Great Outdoors program, Interior has established 10 national wildlife refuges and seven national parks since 2009. Under Secretary Salazar’s leadership, since 2009, Interior has authorized 34 solar, wind and geothermal energy projects on public lands that total 10,400 megawatts – or enough to power over three million homes. Salazar also oversaw a visionary blueprint for solar energy development in the West and established the nation’s first program for offshore wind leasing and permitting in America’s oceans. Salazar has also undertaken an historic overhaul of Interior’s management of oil and gas resources, implementing tough new ethics standards for all employees. He led Interior’s response to the Deepwater Horizon oil spill and split the former Minerals Management Service into three independent agencies. Interior has offered millions of acres offshore in the Gulf of Mexico for safe and responsible exploration and development and is proceeding with cautious exploration of Arctic resources, a development that environmental groups seek to block, saying the fragile and pristine Arctic cannot withstand an oil spill.